Whether you have Allen-Bradley, Siemens, GE, or other domestic or foreign PLC requirements, we can troubleshoot, program, or provide a complete system for you. We provide 24-7 Service Coverage. 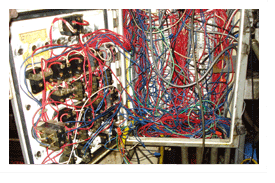 Do your panels look like spaghetti junction? 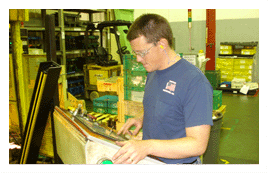 Do you have obsolete parts, and battle continuous downtime issues? Do you have insufficient internal support to quickly find and solve problems? 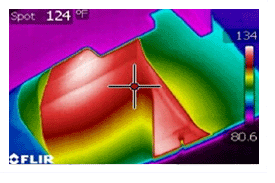 Let us help you determine if it’s time for new controls or an upgrade of your current system. 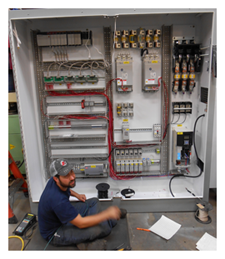 If you are on a tight budget and need controls, we may be able to use some of your existing devices, panels, cabinets, etc. 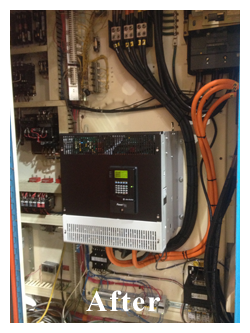 These panels were refurbished, and the controls were updated, saving the customer both money and down time. 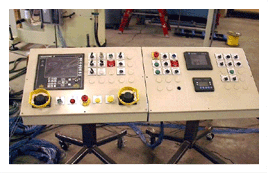 Custom control panel to run a tandem press line. Press speed and ram position are synchronized. 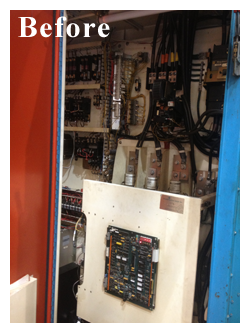 See CONTROL PANEL for more info. 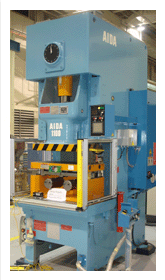 Do your presses or machine tools need presence sensing devices (light curtains), lift gates, perimeter, or any other type of safe-guarding? Give us a call, we can help. 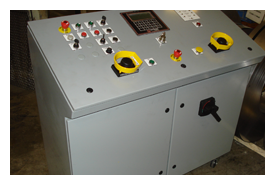 All presses are required by OSHA to have electrical press inspections, in order to maintain a safe working environment, and to remain in compliance with current standards. Let us help you stay in compliance with current regulations, and maintain a safe work environment. If you are considering moving or purchasing a press, we can inspect it prior to moving or purchasing.. 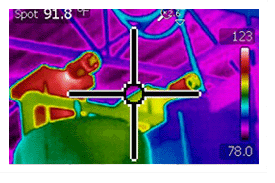 Same metal stamping press using Thermal Imaging to reveal that the counterbalance temperature is elevated. 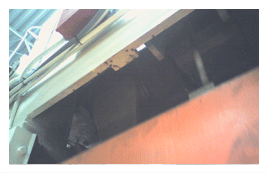 Same metal stamping press, revealing the same connecting rod operating at 134 degrees while the other connecting rod was running at only 86 degrees. The lubrication system needs to be checked. 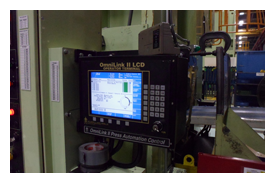 Not sure if your presses are in compliance with current OSHA or ANSI regulations? 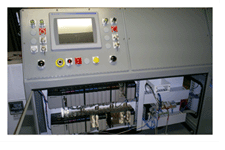 We can inspect your press controls whether they are a custom hybrid control, Link, Wintriss, Toledo, Allen-Bradley, etc. We will provide you a with written detailed report listing any violations and detailing recommended corrective procedures. 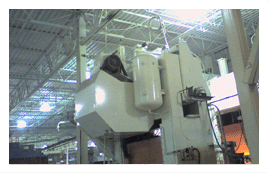 A stop time analysis will be provided with each press inspection. 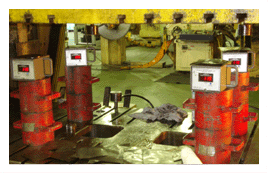 We can also provide Tonnage Monitor calibrations along with your press inspections. If you do not currently have Tonnage Monitors, we can recommend and install various brands for you. Spending too much money on die and press repair? In addition to Tonnage Monitors, we can provide die protection solutions to help you identify broken or worn punches, or proper part progression. 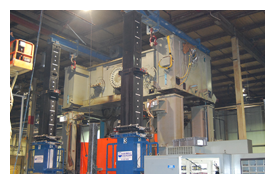 If you are looking for a "turn-key" project, whether it’s moving a press line, machine tool, robotic line, conveyor line, or any type of industrial machinery, then we can take away the sleepless nights. We can run all conduit, air lines, cables, etc. to fulfill your needs. 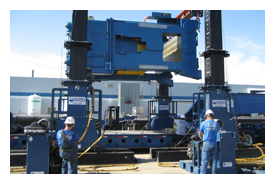 We work closely with a network of companies that can provide machine and press repair, robots, used and new equipment, specially designed conveyor systems, special equipment, vision inspections, rigging and trucking. These are a few of the services that we can supply along with ours for a true “turn-key” project.